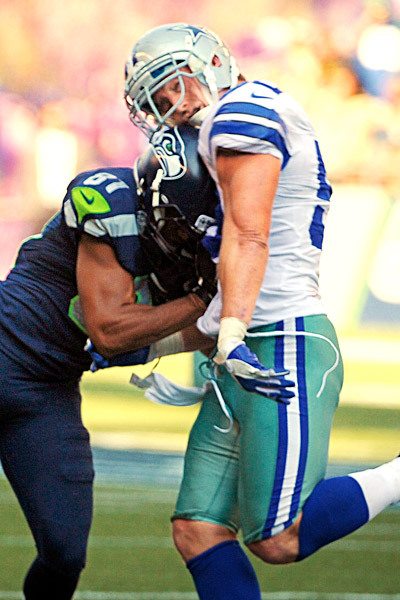 Let's ask Sean Lee shall we. Show this from the other angle and you will see his left pad in his chest. It's impossible to have a pure shoulder block without any contact from the head. The question is not, "did his head contact his body? "; but rather, "did he lead wit his helmet". The answer is no; he led with his shoulder, hit him in the sternum, his helmet happened to touch, and he finished with his arms- get over it. "We all we got, we all we need"
I loved the home uniforms before, but seeing them in action is crazy. Best uniform of all time IMHO. All the neon green cleats, gloves etc, makes it. Good game fellas, we got out hit and out coached. That stadium was a rockin after the special teams cost us 10 points early. No excuses the Seahawks were clearly the better team yesterday. On a different note, Who else thought Sidney Rice was going to be out the rest of the season when he got blown-up on the hit early in the game?, I couldn't believe he got up and played the rest of the game... and Tate showing some swag with that hit on Lee, I think the swagger that our secondary/defense/O-line has is starting to crossover to our WRs, and I like it a bunch..
Yea, definitely. I was shocked to see him get up, I thought he was out for at least the rest of that game. Hopefully that's just a sign of things to come for him on the injury side of things. Wilson cannot continue to lead his players into death traps like that though. Run blocking was decent in the 2nd half but still atrocious in the 1st half. I won't get too high until I see it for a full game. I thought it was big to get Turbin going in the 2nd half because it really seemed to keep Lynch fresh and motivated. Interesting tactic by Carroll to alternate Moffitt and Sweezy every series. Never seen that before. Why is Russell Okung so mad the Cowboys lost? Location: Hello. My name is Inigo Montoya. You killed my father. Prepare to die. yea it is a penalty and that is why the NFL has turned into flag football. If you cant have hits like this anymore why not just put flags on the players and play flag football. Don't know if this has been posted here or not, but found it funny! Any make a Sig for cowboys yet??? I'm having it done by an Eagles fan now.